My, how times have changed. Ten years ago, my boyfriend (now husband) and I wouldn’t have missed the New Year’s traditions of dressing up, going out with friends and popping the bubbly at midnight. These days, with 2 small children at home, I am embarrassed to admit that we are more likely to be asleep at midnight on New Year’s Eve. Lame? Yes. Regretful? Not really. Do you have any idea what babysitters charge these days? The fact is, our priorities have changed. It is easier to stay home with the kids than to plan ahead and make all the arrangements to go out on New Year’s Eve. But as a couple, we still feel the need to acknowledge the New Year in some way. Should we create new New Year’s traditions that involve the kids? Let them stay up to watch the ball drop in Times Square, like I did as a child? Do we have them write down thoughts or create artwork and keep a family “time capsule” to open in later years? Should we all make New Year’s resolutions? Or maybe we should dress up, but stay home and have a special New Year’s Eve family dinner? Well, it’s decided. My in-laws are going to be spending the weekend at our house, thrilled to get time with our kids alone. My husband and I are taking a little mini-vacation, staying at a great hotel for two nights. Now that I think about it, New Year’s Eve is a concept that is wasted on the young. Happy New Year to us! 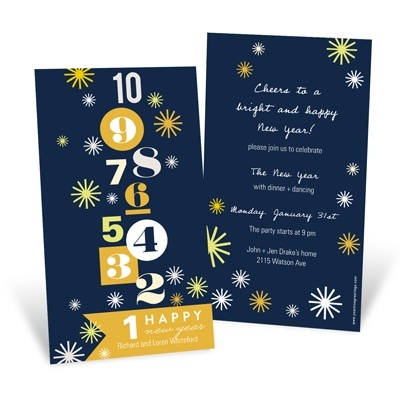 Look for more New Year’s ideas on our blog!